Born in 1996 Rolling Thunder was bred and raised by Stevenson Angus Ranch at Hobson, MT. 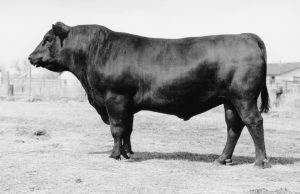 He is the sire of the dam of our “106” bull as well as the Eliminator bull on our website. Darrell Stevenson told me that Rolling Thunder was one of his all-time favorite sires of females. That is precisely why we used him in our A.I. program. True to form his heifer calves have that maternal phenotype that we like. What surprised us was the performance of his bull calves. They are peas in a pod and are very structurally correct. Both his sons and daughters had a very low cull rate for us. Many of his sons in this sale are suitable for use on heifers and should leave you with an exceptional set of replacements. Rolling Thunder’s dam was one of the most impressive females I have ever seen and had the production record to back it up. We think you will like this sire group.